Zombie Parkour Runner, a side-scrolling iPhone paltformer game that provides a surprising amount of entertainment. The last few years have seen parkour gain some momentum with mainstream audiences, along with a massive increase in the popularity of zombies in pop culture. Given these two facts, it should come as no surprise that Break Media have taken both elements and made an iPhone app out of them. The app starts out with a simple enough overview of the premise: Zombies have stolen Kara’s stuff. Yes, it’s a little far-fetched, but the game doesn’t take itself too seriously. After a brief intro, you’re free to start collecting coins and getting Kara’s stuff back. It’s divided into levels that are categorized by different settings. The three free chapters are City Center, Construction Area and Amusement Park. A fourth chapter, Oldtown, is available for purchase. With eight levels in each chapter, you get a respectable 24 levels for free. Progression through the app is straightforward. Once you beat a level you unlock the next one, and you unlock the next chapter after completing all eight levels in a chapter. In a scoring system very reminiscent of Angry Birds, each level gives you a score out of a possible three stars. The gameplay in Zombie Parkour Runner is both in-depth and very simple. Your character is constantly moving along the rooftops of the city. You can jump, long-jump, wall-run and perform parkour moves to evade zombies and cross gaps. Even though the controls are basic enough that you can play with one hand, you’ll still find that it’s a pretty challenging title. You start off with basic controls available and learn new moves along the way, ensuring that the learning curve isn’t too steep. Despite the fact that it’s in 2D, Zombie Parkour Runner is a visually attractive application. It does stay within its boundaries, so you shouldn’t have any issues playing it regardless of what iOS device you’re using. I was playing on an iPhone 4 and never experienced any slowdown, and can’t imagine that even owners of the older iPod Touch or iPhone models would have any issues. Visuals were smooth and everything rendered properly. Zombie Parkour Runner is an iOS title that turned out to be a pleasant surprise. Although the first level was very simple, I found myself being much more challenged just four or five levels into the title. I found myself taking frequent breaks from writing this review just to try and progress through the title a little. Especially since the game is a free title, it almost certainly warrants a download just to see if you enjoy it. Even if you’re not a fan of zombies or parkour, the gameplay is universal enough that there’s still a chance you’ll enjoy it. 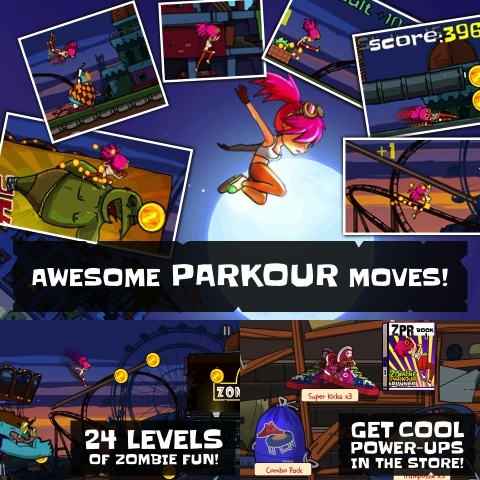 AppSafari review of Zombie Parkour Runner was written by Darius Reimm on March 5th, 2012 and categorized under Action, Adventure, App Store, Games, Platformer. Page viewed 4301 times, 1 so far today. Need help on using these apps? Please read the Help Page.